A macrame wall hanging is an easy DIY project that will add a handmade touch to any room in your home. This free tutorial will help you create a wall hanging with a lot of interesting patterns, such as spirals and triangles. Don't be afraid to change it up to make it your own. Despite how it looks, this is a simple project that will just take you an hour or two to complete. It really comes together fast and you'll find lots of opportunities to add your own style to it. This is just one of many free macrame patterns that include plant hangers, bookmarks, curtains, and a whole lot more. 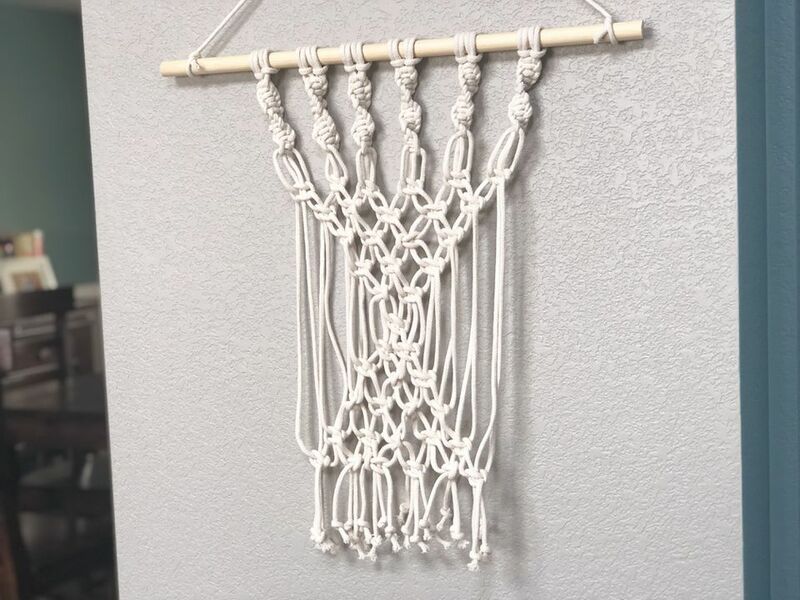 The knots you'll be using for this macrame wall hanging include Lark's Head knot, Spiral knot, and Square knot. You can learn how to tie all these knots by reading our guide on how to macrame. I'm using cotton clothesline for my macrame cord. It has a wonderful natural look to it and is fairly inexpensive. The wooden dowel doesn't need to be these exact dimensions and in place of the wooden dowel, use whatever size you like as long as you can fit all the ropes over it. If you'd like to give it a more outdoorsy feel, you could use a tree branch about the same size. Cut a piece of macrame cord that's three feet (one meter). Tie each end of the cord to the two sides of the wooden dowel. 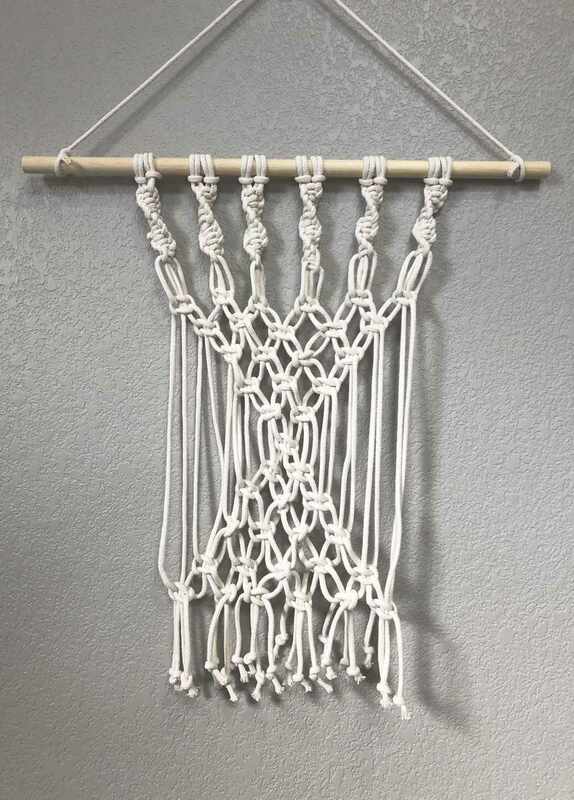 You'll use this to hang your macrame project when it's finished. I like to attach it at the beginning so I can hang the macrame project as I tie knots. Working this way is much easier than laying it down. Cut your macrame cord into 12 lengths of rope that are 15 feet (4.5 meters) long. This may seem like a lot of cord but knots take up more cord than you would think. There's no way to make your rope longer if you need to, so it's better to cut more than you'll use. Fold one of the macrame cords in half and use a lark's head knot to attach it to the wooden dowel. Attach all the other cords in the same way. Take the first 4 cords and make a left-facing spiral stitch (also called a half knot sinnet) by tying 13 half knots. Use the next set of four ropes to make another spiral stitch with 13 half knots. Continue working in groups with four cords. When you finish, you should have a total of six spiral stitches. Measure approximately two inches down from the last knot in the spiral stitch. This is where you're going to place your next knot, the square knot. Using the first four cords, make a right facing square knot. Continue making the right facing square knots all the way across this row. Do your best to keep them all horizontally even with each other. You'll end up with a set of six square knots. Now it's time to start decreasing the square knots so we can have a "V" shape of knots. Leave the first two cords and the last two cords free. Make right facing square knots with each group of four. You'll now have a second row with the two first and two last cords unknotted and five square knots. It doesn't matter how you space these, just keep them even with each other for each row. For the third row, you're going to leave out the first four cords and the last four cords. You'll have four square knots. For the fourth row leave out six cords at the beginning and six cords at the end. You'll have three square knots. In the fifth row, you'll leave out eight cords at the beginning and eight more cords at the end. You'll have two square knots now. For the sixth and final row, you'll leave out 10 cords at the beginning and 10 cords at the end. This will leave you with four cords to make one final square knot. Time for more square knots! This time, we are going to be increasing them to form a triangle, or an upside down "V."
For the first row of this section, leave out the first eight and last eight cords. You'll make two square knots. In the third row, leave out six cords at the beginning and the end. You'll have three square knots in this row. For the fourth row, leave out four cords at the beginning and four at the end. You'll have four square knots. In the fifth row, leave out two cords at the beginning and the last two cords. Now you'll have five square knots in this row. For the last row, use all the cords to make knots. You'll have six square knots for this row. Time to give your macrame wall hanging a nice trim. Leave some space (about six to eight inches) under your final row. Use your scissors to cut the cords straight across. You can leave it like how it is, add some beads, fray your ends, or tie simple overhand knots like above.